I downloaded GLTools plugins and i put the file in "Library/Graphics/Quartz Composer Plug-ins". when i start QC they don't appear in the "Patch list". I'm on a macbook pro 1,86 GHz and i use Leopard. Are those plugins compatible with Leopard? Or maybe i must do any particular thing (that i don't know) in order to use GLTools? ~/Library/Graphics/Quartz Composer Patches/ maybe? That's where all of mine are. Wait. /Library/Graphics/Patches?! That's Tiger (10.4), right? You'll want /Library/Graphics/Patches in that case (and, you'll need Tiger-supported plugins. Most of the beta stuff isn't happy on Tiger anymore... still working on backporting recent changes to Tiger. i'm not on tiger (10.4) i'm using leopard (10.5) and i found the folder "/Library/Graphics/Patches" but not the folder "/Library/Graphics/Quartz Composer Patches"
however, do you confirm to me that GLTools work fine under Leopard? I just tried the beta (in place of my current build) in /Lib... and ~/Lib... and it worked on both places. By chance, do you have the 10.5.1 update? (I've not upgraded, maybe the update changes something in QC? The release notes didn't mention anything, but I've been holding off till I have time to image my current installation just incase) -- I'll try to take a look at this this week. Can you check QC's build/version number? should be 3.0/63. can you also try a couple other patches (betas for leopard)? could you check Console.app to see if it's generating any warnings or messages? Try manually looking through the patch creator's list; The names probably won't match any searches you've performed (GL is in the Category name, as is Kineme). So, Search by category for "Kineme", description for "kineme.net", or maybe by name for "quad" or something, just to see if it turns up something. By chance, do you have the 10.5.1 update? i tryed "TexturePatch-200710311246.zip" and it works fine. i put it in "/Library/Graphics/Patches/Quartz Composer Patches" it added 25 new patches in my patch list in the same way i tryed "KinemeCorePlugin-20071110" it seems to work; it adds a new voice in QC menu, but no new patches in "patch list"
let see... three different folder and the same message:"is not a valid Quartz Composer plug-in"
sorry, this may have been asked but I just can't solve the problem. 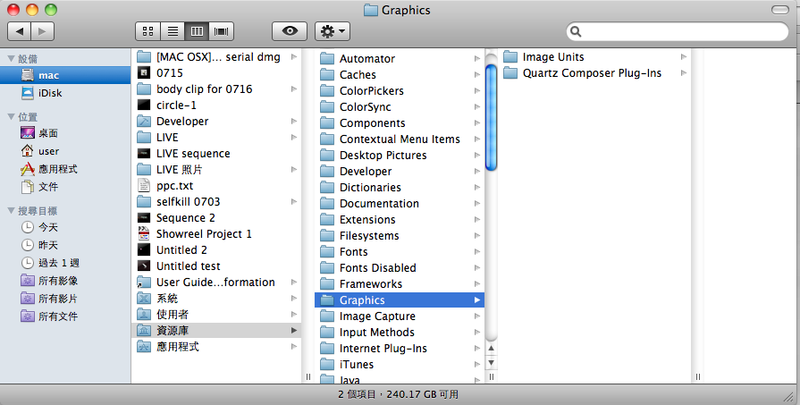 That is, I don't have "Quartz Composer Patches" folder under (~/Library/Graphics/) All I have is "Image Units" and "Quartz Composer Piug-ins" as you can see the attachment snapshot. You're not the first and you will not be the last. The answer is staggeringly simple. That is where you install or drag and drop Kineme plugins and your own and 3rd party macros that do not install themselves. You could also download Kineme Core and then use the plugin helper to make sure that you have your plugins all tickety-boo. Now it works! I did as your instruction and the plugin runs perfectly fine. Thanks a lot!! Problems with the particleTools patch!